I am offering this original painting called "Sweet Nie" up for silent auction. For all the details go HERE. The bidding will begin the morning of Friday October 3rd Thursday, October 9th, and will end that night at around 10:00 pm PST. This little painting measures 8x10, and is acrylic and ink on canvas. The edges are painted so it can be hung with or without a frame. 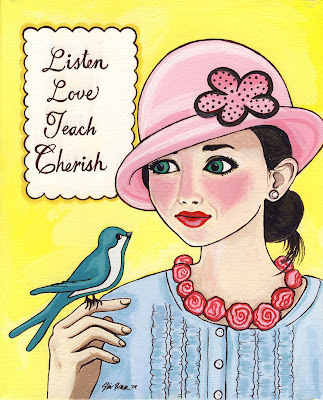 It was inspired by the sweet Nie Nie aka Stephanie Nielson and words of inspiration taken from her blog. 100% of the proceeds will be donated to the Nielson Family. The highest bidder will make the payment directly to the Nie Nie fund, and email me a copy of the receipt. I also have a matching Nie Softie that I am almost finished making. It will be auctioned off that day as well, check back for pictures. or to get updates on the Nielson's recovery go to Nie's sister's blog cjane. Also thank you Morgan for all your hard work with the Nie Nie Benefit on Etsy! Here it is! The reason I haven't been doing much else lately. 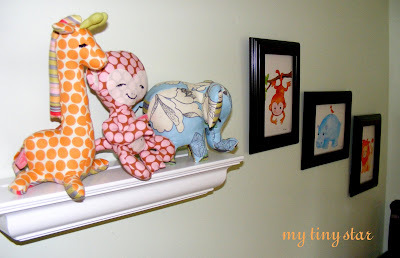 and coordinating wall art of course. Okay, I got a bit carried away, but I love how it all turned out. 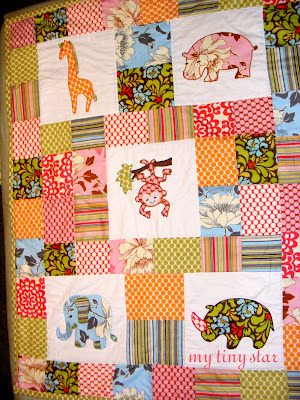 The blanket is all quilted by hand, and the stuffed giraffe, monkey and elephant are made from my own patterns and were sewn with coordinating fabrics. The bumper has appliqued animals parading all around the crib, and I had to paint some happy little watercolor illustrations for a finishing touch. 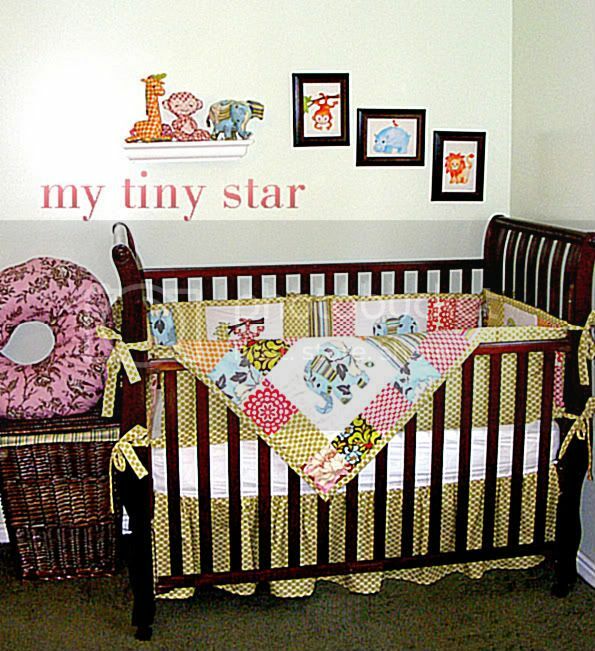 The fabrics I used are all various Amy Butler prints with a little Heather Bailey as well. All the animals were taken from my sketch book, and frankly I think they are so happy to finally be free range! 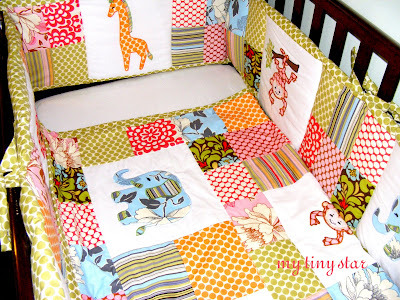 One lucky baby gets to sleep in this fun and colorful set. Now I plan to spend a few days catching up on my housework, then back to creating more messes and fun things! I have been working on a big project the past month, and it is just a few seams away from being finished. Whew! Pictures of this fabulous creation will be posted very soon. I am so excited to announce that I've been invited to join Spoonflower. 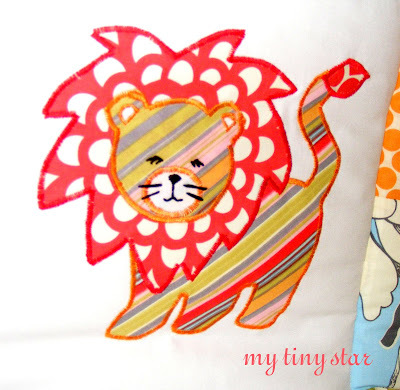 Spoonflower is a site that offers designers the chance to get their own designs printed on fabric. I have so many ideas, I just don't know what to do first. I promise you will be the first to see what I come up with. Well, I have to get back to those seams, I just thought I'd drop a note to say I'm still living. Nie Nie Donations from ALL print sales! Here I am babbling about rice candy, and there is a family in real need. 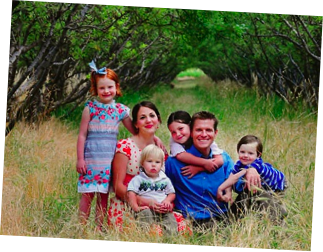 Stephanie and Christian Nielson were in a plane crash a few weeks ago and they remain in critical condition at Maricopa Burn Center in Arizona. Christian has sustained burns on over 30% of his body. Stephanie’s body was burned over 80%. They have 4 small children yearning for their mom and dad. Family and friends have started a donation fund to aid in their medical bills (which they estimate will be in the millions) as well as the household expenses while they recover. Read more about them here. I'm a bit late in joining in the effort, but better late than never I say. For the next 2 weeks 9/8/08 - 9/22/08 the proceeds of all my print sales will be donated to the nienie fund. That means the full purchase price of each print (excluding shipping) will be given to the Neilson family. A special gift will also be given with each print purchases. 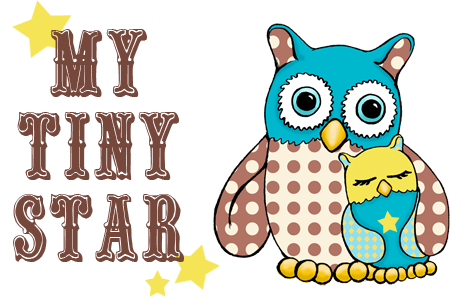 If you are not wanting a mytinystar print at this time, there are many other items being sold for this cause at design mom check for listings marked live. Or you can make your donations directly through the link on my left sidebar. It's not much, but every little bit helps! 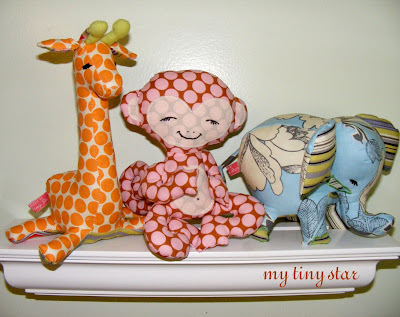 One of my favorite posts from Stephanie's blog can be found here. It really puts things into perspective, what great people! I have been trying to cut back on my sugar intake. Instead of having it make up 80% of my diet, I 'm working toward 40-50%. So as I am sitting here feeling deprived, I thought of my favorite treat on earth so far. Japanese Rice Candy. 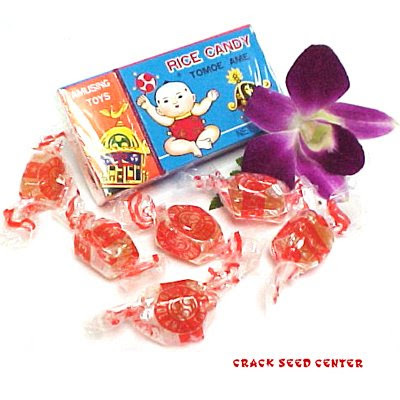 If you have never had rice candy, you must get some right now! They have just the perfect amount of sweetness and chewiness, and I'm not sure what flavor they are supposed to be, but I think it's called "perfect". My parents grew up in Hawaii and Hong Kong, and appanently these types of treats are plentiful there. but now the prints of these acrylic paintings are available in the shop! Also, if you get a chance, I have a little poll on the right sidebar. I'd love your input! This was my shirt when I was a baby, and of course I still have it. Hooray for the girl who never throws anything away! Who knew I would have my own little Star baby to wear it too? It's a little faded and now it's quite slobbery, but still a great shirt for a great little Star!